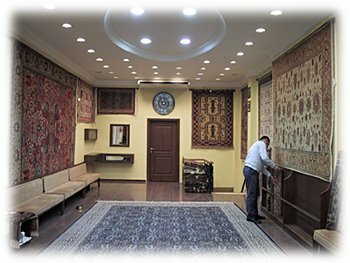 At Hereke, our mission is to inform, educate and present to our clients the craftsmanship, culture, quality and beauty of handmade Turkish Rugs. We know your purchase is an investment and therefore a very important decision. When choosing from our vast collection of Kilim and pile rugs, pure wool, pure cotton, pure silk, wool on cotton, old and new postcard-sized to oversize, our certified experts can assist you with finding the finest quality handmade rugs to suit your desires. With years of experiens in the fields of manufacturing and retailing, We guarantee you the most competetive prices and exceptional quality. Our experts are skilled at presenting demomstration and lectures in every major languag.and we accept private appointments or tour groups of all sizes. When in Istanbul, you are never more than a phone call away. Come discover the magic of our carpets.